Don't forget to vote for me for Iron Cupcake Earth: Wine. 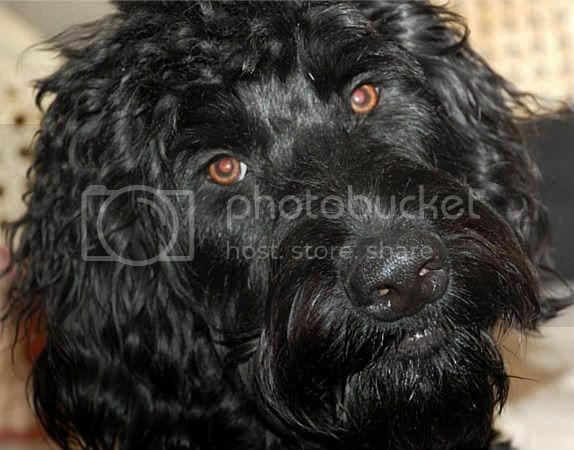 To vote click here. The poll is on the right hand side of the page. Voting will be held thru February 4Th at Noon (central time). 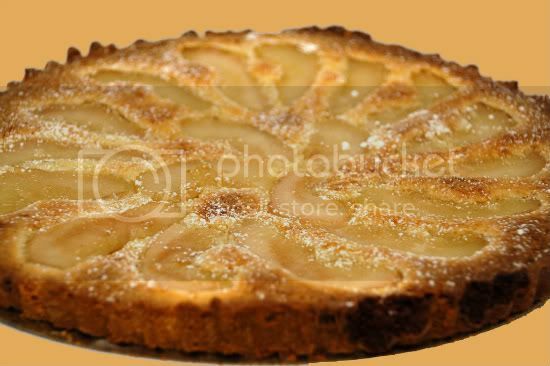 This month's daring baker's challenge was chosen by Karen of Bake My Day and Zorra of 1x umruehren bitte aka Kochtopf. They chose Tuiles from The Chocolate Book by Angélique Schmeink and Nougatine and Chocolate Tuiles from Michel Roux. This was by far the most fantastically creative recipe chosen to date. Tuiles are a thin and crisp cookie that become malleable post baking which allows for endless shapes, sizes, and colors. 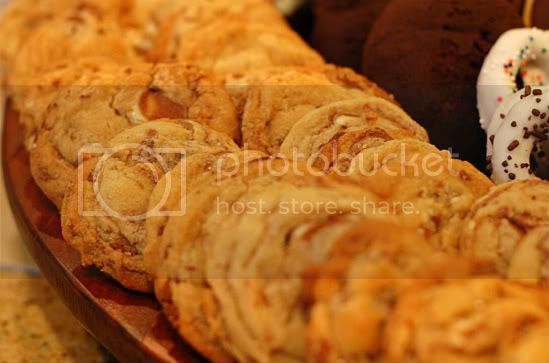 These cookies really gave us Daring Baker's a chance to expand our horizons! I shaped my tuiles into little squiggles (or waves) that I dipped in chocolate as well as mini cups which housed a generous dollop of brown sugar Swiss meringue buttercream and a pistachio. I was really amazed to see how much can be done with this recipe. Due to the fact that I was on a time constraint, I really wasn't able to shine in the "creativity" department. 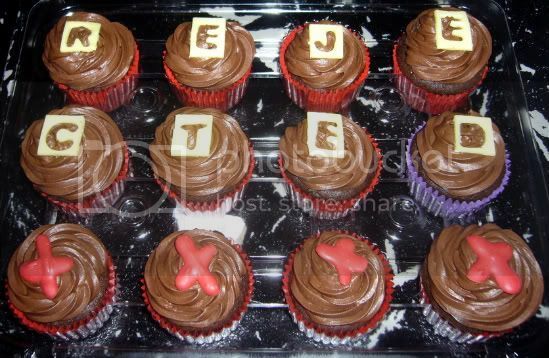 I will most definitely be making these again and experiment with different shapes. The actual cookie was light and refreshing. It had a fortune cookie kind of a taste; not too sweet but dainty enough to be an after dinner cookie. Check out what the other Daring Baker's did here! 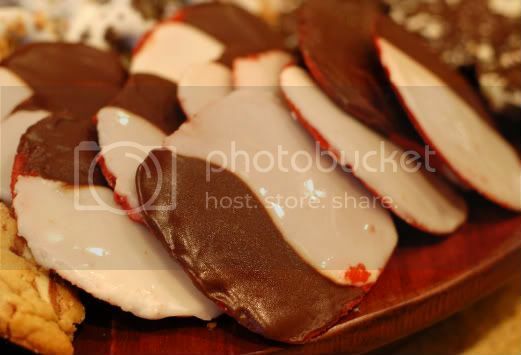 I seemed to have lost all my pictures that I took of these cookies! I only recovered 1 picture and it's awful, so forgive me :) I did my best to fix it up. Yuck. Using a hand whisk or a stand mixer fitted with the paddle (low speed) and cream butter, sugar and vanilla to a paste. Keep stirring while you gradually add the egg whites. Continue to add the flour in small batches and stir to achieve a homogeneous and smooth batter/paste. Be careful to not over mix. 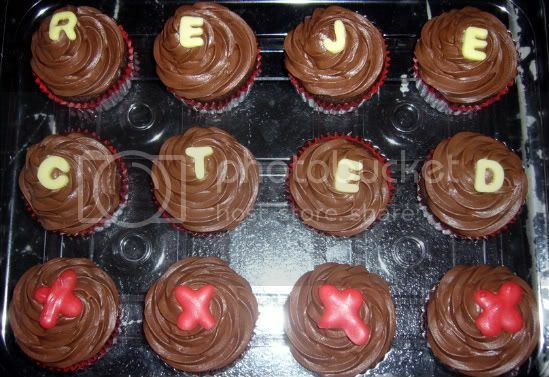 Here are some more pics of the Rejection Cupcakes from last night. The book release party was a huge hit! I didn't have my good Nikon camera with me so forgive me for the hideous flash in the picture. My unbelievably talented and amazing cousin released his book today!! 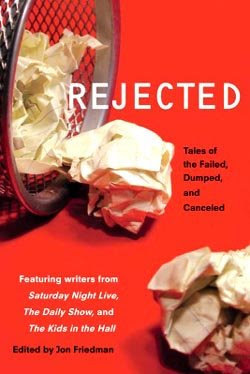 Rejected: Tales of the Failed, Dumped and Canceled". If you're looking for some humor in your life then I highly suggest you purchase this fun, hilariously witty book based on a collection of rejection stories-and works-by some of today’s most accomplished comic writers and performers (some world famous) sharing their pieces that were ripped to pieces and their own experiences of being handed their hats, heads, and hearts on a platter. Available for purchase at Barnes and Noble, Amazon.com, and Borders NOW! 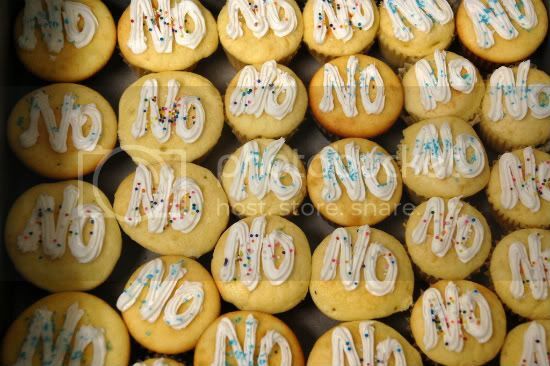 "NO" cupcakes! 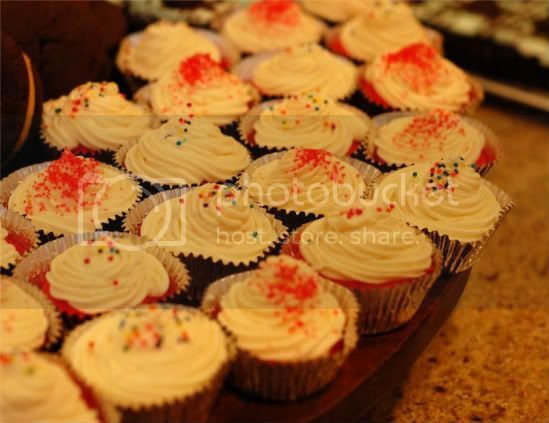 These cuppies were vanilla cake using piped vanilla buttercream. 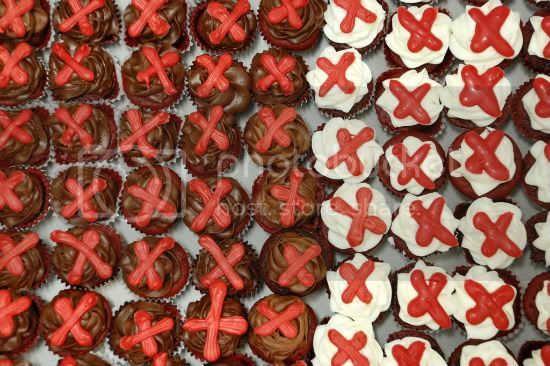 I figured I could pretty much pipe anything negative on these cupcakes to represent the idea of rejection and "no" definitely qualifies as the #1 indication of rejection. If you are in the NYC area and would like to come to the party tonight, click here! Heather of Sherry Trifle chose this week's TWD recipe: Chocolate gingerbread. 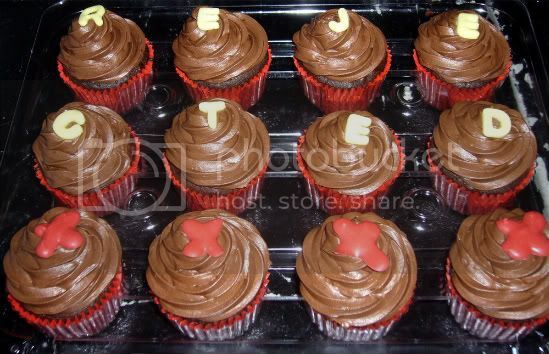 I was in a cupcake kind-of-a-mood and decided to whip up a dozen of these. 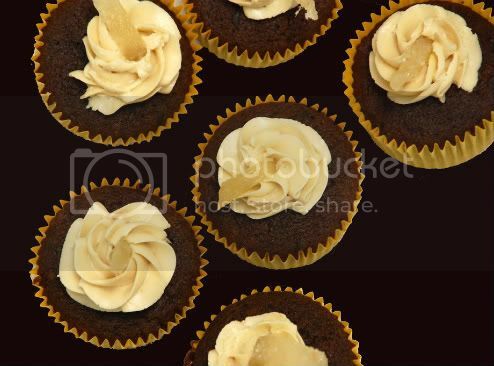 I followed the recipe to a "T" and topped each cupcake with brown sugar Swiss meringue buttercream and garnished with crystallized ginger. These were fun, cute and not overly sweet. Although the ginger smelled extremely potent, the taste was not overwhelmed by ginger at all. The cake was light with a touch of density to it and the suspended chopped bittersweet chocolate pieces throughout made this cupcake a real treat. For the recipe, go to Jessica's blog here. This month's Iron Cupcake Earth challenge ingredient is wine. I've only cooked with wine, never baked. So, I was excited to experiment especially since I have so much unopened readily available wine in my apartment. Whenever I think of red wine; chocolate comes to mind. Why, you ask? Seriously I have no idea...but it just does! 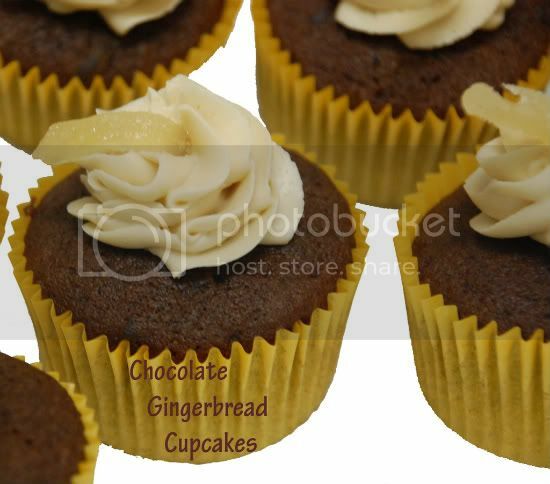 Therefore, I knew right off the bat that I wanted to incorporate chocolate..and not just chocolate, but rich, dark, deep chocolate giving this cupcake a super sophisticated taste. For added fun I incorporated chopped toasted pecans into the batter for a little extra umph. I made a deep dark chocolate ganache to top the cupcakes with. 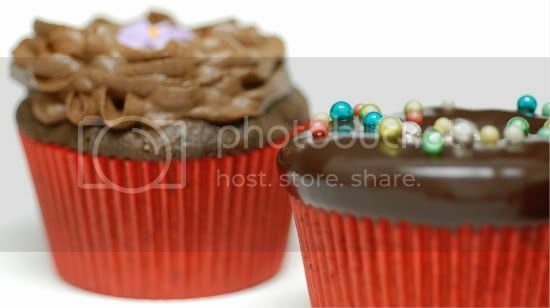 For half of the batch I poured the already warm ganache along the tops and garnished with multi-colored dragees. 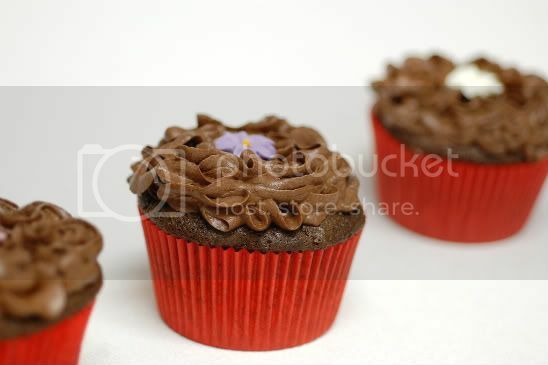 For the other half I whipped the ganache in my Kitchen-Aid mixer on high speed until fluffy and piped it on the cupcakes with a little fondant flower for garnish. These cupcakes were fantastic! The wine added a bit of zing without being overbearing. The actual cake was very moist and rich and the toasted pecans added just enough crunch. The ganache couldn't have been any more complimentary. I used Lindt's extra intense dark chocolate which proved to be..well, intense..
Be sure to vote for me at No One Puts Cupcakes In A Corner beginning January 24th at Noon (central time). ICE is giving away awesome prizes for the winner. 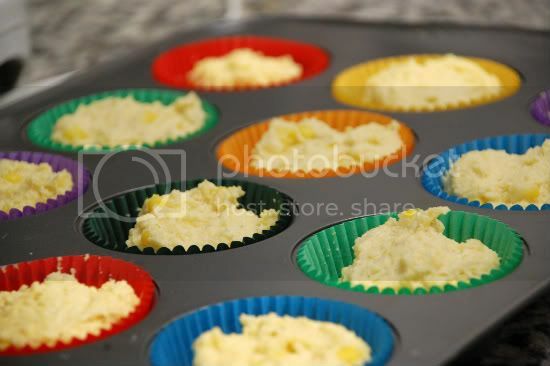 Preheat oven to 350 degrees F. Line cupcake tins with papers, or grease well. Combine sugar, flour, cocoa, baking powder, baking soda and salt together in a large bowl. Cream the egg, sour cream, oil and wine together in mixer for two minutes. Stir in flour mixture until well combined. Add 1/4 cup boiling water and stir. 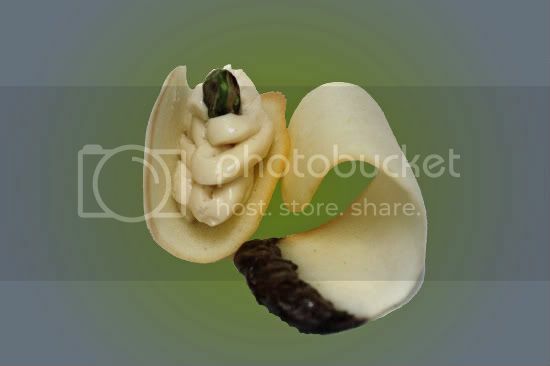 Fold in chopped nuts. Batter will be fairly thin. 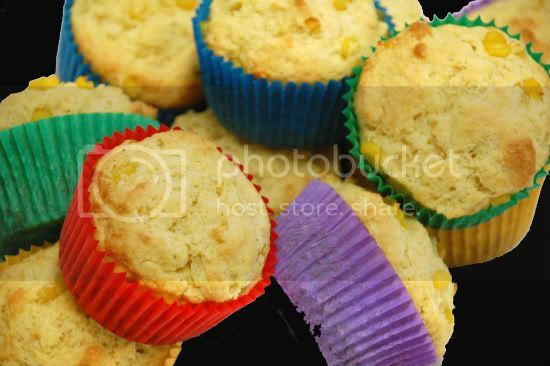 Pour into prepared cupcake tins and bake for approximately 17-20 minutes, or until toothpick inserted in center comes out clean. To make ganache–Place chocolate in bowl. In saucepan bring whipping cream to boil over high heat. Pour hot whipping cream over chocolate and stir until chocolate melted. Add vanilla and salt. 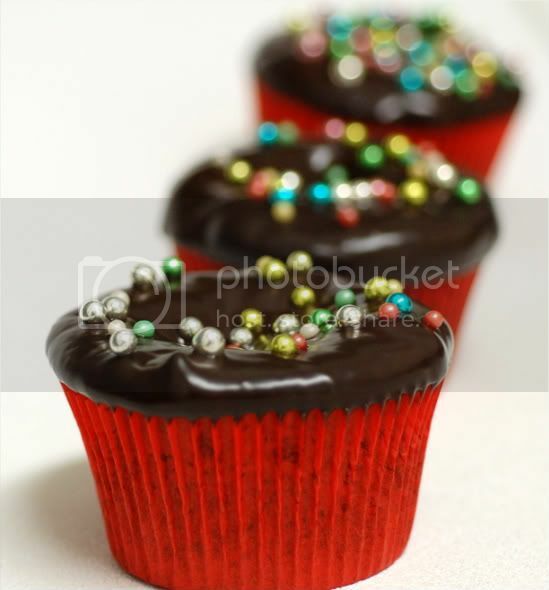 Spoon ganache over cupcake. Ann of Meet Me In The Kitchen chose this week's TWD recipe: Berry Surprise Cake! Boy was I surprised when this cake came out to be completely unappealing. I found the actual cake to be too dense, the filling to be absolutely tasteless and the berries to be completely out of season. All of these negative factors combined really surprised me being that this is a Dorie Greenspan recipe; and lets face it, everything she creates is fantastic whether it's my cup of tea or not. 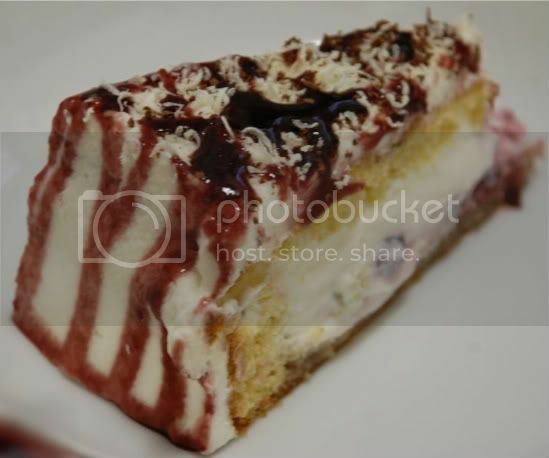 In order to add some sweetness/taste I grated chocolate on top; white and semi-sweet. I then took some raspberry sauce and drizzled it all over. Alas, this cake was still doomed. This, my friends, is not a recipe that I recommend and/or will be making again in the future. Not everything can be a slam dunk..right? Peanut butter creme Oreo crust. Brownie stratum. Peanut butter mousse blanket. 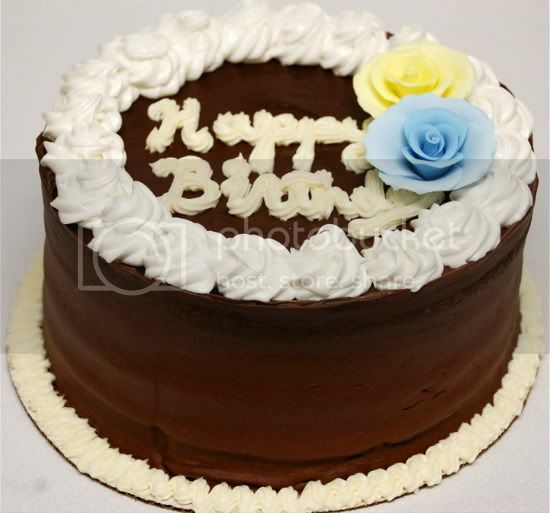 Silky chocolate ganache layer. Topped off with crushed Reese's peanut butter cups, honey roasted peanuts, and mini semi-sweet chocolate chips. Need I say more? If you are a peanut butter/chocolate lover then this dessert is for you! These were incredible!! My most favorite dessert combination is peanut butter and chocolate and these bars were kryptonite for me. I couldn't keep my hands off them. Awhile back I made Dorie's Peanut butter chocolate torte which was my favorite Dorie recipe to date. 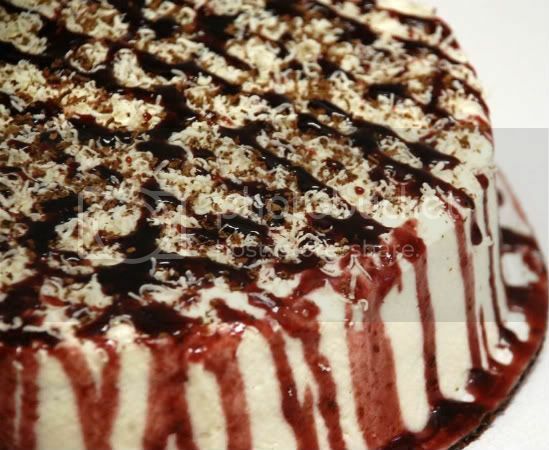 I thought it would be fun to make a version of this torte in bar-form. As explained above, I made the crust using crushed peanut butter creme Oreo's. The brownie layer was made using Smitten Kitchen's 'one bowl brownie' recipe which was then topped with peanut butter mousse from Dorie's original chocolate peanut butter mousse torte found here. I went over the top by drizzling a delicious dark chocolate ganache atop the mousse then garnished with crushed Reese's, honey roasted peanuts and mini chocolate chips. Wallah! A luscious chocolaty peanut buttery creamy gooey dessert. Please, make these for your own good...or, in that case, maybe you shouldn't...??!?! *Please note* I ended up cutting these bars into thirds because they were SO rich. A little goes a long way with these bad boys. RECIPE: Use a 9X13 inch pan. *Put the finished mousse in the fridge until needed. Using this recipe, bake the brownies over the pre-baked Oreo crust. I was informed that she wanted a simple yellow cake with chocolate frosting. That's easy enough, right? I reverted back to my oh-so-favorite Billy's yellow cake recipe and baked 2-8inch pans of batter. Once cooled, I cut each 8inch round in half creating 4 layers. I cake'd on (no pun intended) LOADS chocolate frosting in between each layer and all around the tops and sides. 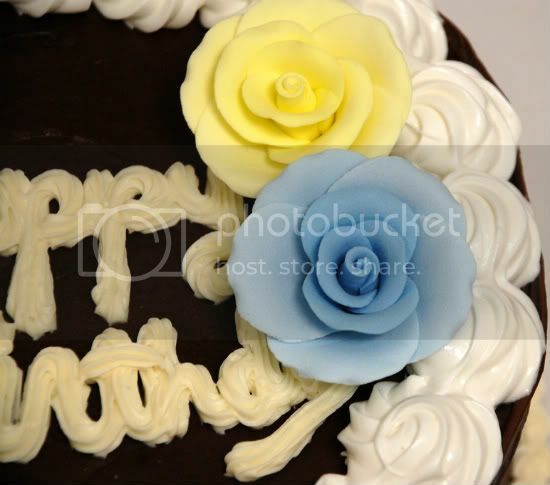 I decorated with some vanilla buttercream and wallah! A beautiful, simple classic yellow cake with old school chocolate frosting. Enjoy! 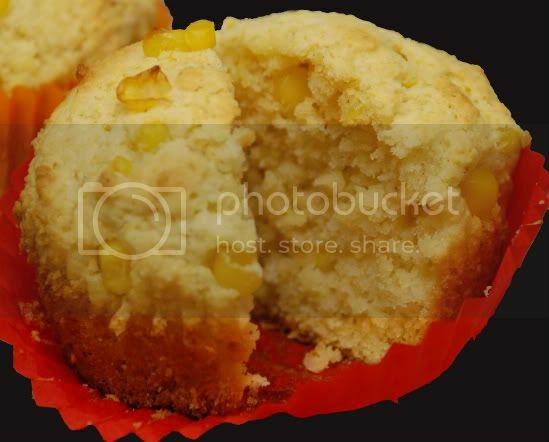 and being that it's negative 100 outside I decided to go with plain, simple corn muffins. These were as delicious as I thought they would be. My boyfriend is ecstatic to try them. that little old school boxed mix better known as Jiffy is officially banned from my kitchen. 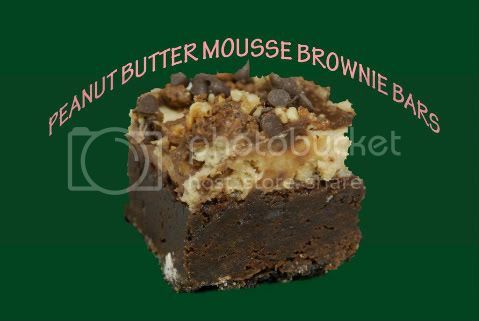 guarantee you'll be a happy camper =) YUM. I had a New Year's eve party in Florida that consisted of fun finger food type of appetizers (i.e. turkey burger sliders and mini steak sandwiches on garlic bread) and crazy amounts of desserts. I displayed all the desserts on this gigantic lazy susan that I found and it truly looked breath-taking! 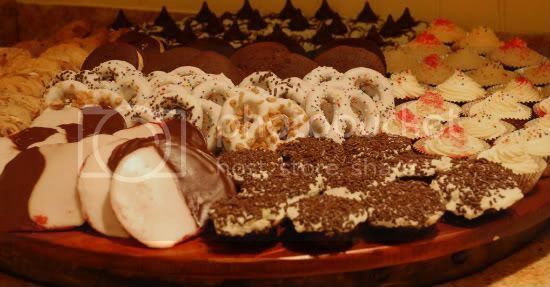 The desserts ranged from cookies to brownies to cupcakes as well as some other fun treats like chocolate covered pretzels and whoopie pies. Rather than creating separate posts for each, just click on the title for their respective recipes. Enjoy! There is no real recipe for these. It's super easy. I bought a mega bar/chunk of white almond bark and melted it according to the package directions. 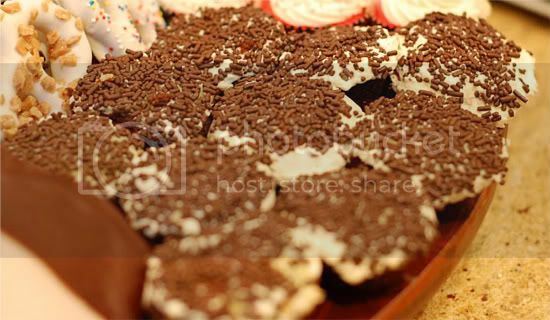 I went on to decorate them with English toffee, chocolate sprinkles, and nonpareils. You can always buy the melting chocolates and change up the colors. These are too good to be true. Peanut butter cream filling recipe found here. I went to Walgreen's and bought these great milk chocolate bars on sale. 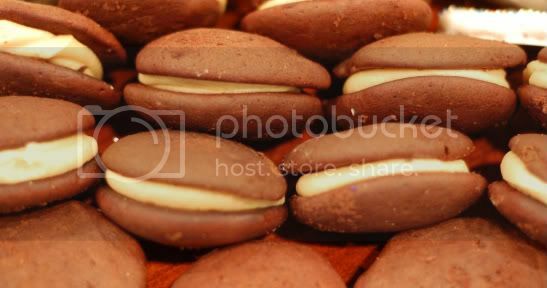 They were literally chocolate bars (about triple the size of regular Hershey bars) filled with a thin milky-type cream. I very coarsely chopped them up and threw them into the dough. 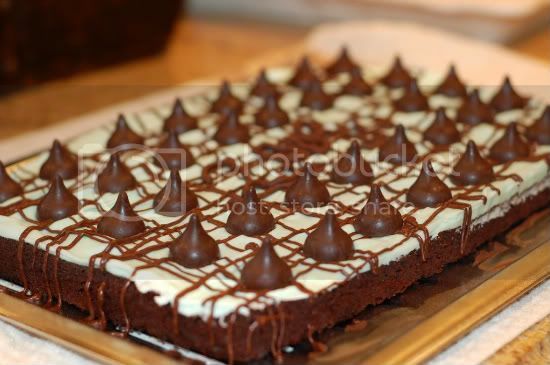 They were a-m-a-z-i-n-g.
An easy chocolate drizzle topped by chocolate mint cream truffle Hershey kisses, these brownies hit the spot. 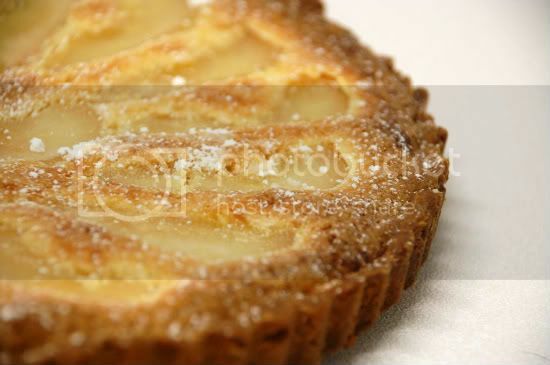 For now, we'll stick to this french pear tart chosen by...wait for it....THE famous Dorie Greenspan herself. Yes, it's true. Our fun-not so little group anymore-is dedicated to Dorie Greenspan's book Baking: From My Home To Yours and Dorie made a guest appearance by picking this week's recipe. 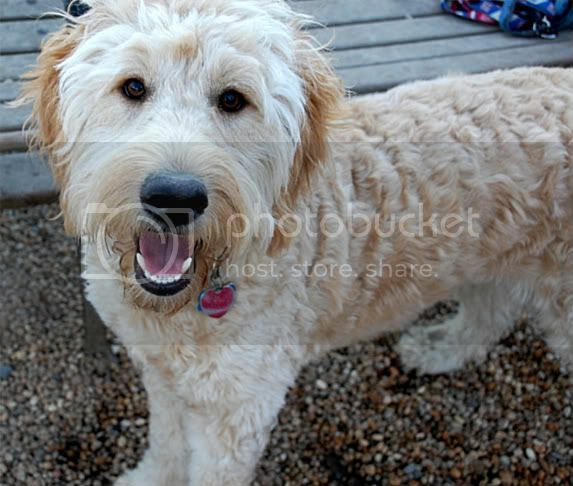 Listen...Dorie, I love you..I really do. I think you're beyond talented and I totally idolize you; but this tart was not one of my favorites. Not because it wasn't tasty, because it was, but because fruit tarts really aren't my thing. I did, however, love the tart crust. It was sweet and flaky and so much more exciting than regular pie crust. I could have easily just spread raspberry jelly or nutella on this tart shell and been happy. So it goes..